Probate is the legal process of proving a decedent's (deceased person's) will, if any, valid and settling his or her estate. An executor is the personal representative named in the decedent's will to administer his or her estate. When the estate's assets are not sufficient to pay debts, the executor may need to sell the decedent's real property. In North Carolina, title to real property vests in the decedent's heirs upon death, and a special proceeding is typically required to bring the property into the estate. Under N.C.G.S. 28A-15-1(c), a special proceeding before the clerk of superior court is not required for a sale by a personal representative made pursuant to authority given by a will, which permission may include a general provision granting authority to the personal representative to sell the testator's real property, or incorporation by reference of the provisions of N.C.G.S. 32-27(2). An executor's deed is an instrument executed by the executor of the decedent's will to convey an interest in real property from a testate estate (so called when the decedent leaves a will) to a purchaser. Personal representatives' deeds typically carry limited warranties of title, commensurate with the office of a fiduciary. This means that the executor covenants that he has not placed or suffered to be placed any presently existing liens or encumbrances on the property conveyed, and warrants and defends the title against the lawful claims of all persons claiming by, through, under, or on account of decedent's estate, insofar as it is the executor's duty to do by virtue of his office, but no further. Recitals of an executor's deed include information regarding the probated will, including the date of death, the county of probate, and the file number assigned to the decedent's estate by the clerk of superior court. In addition, the deed contains a statement that the executor named within was appointed by the decedent's will and is duly qualified to administer the estate; an explanation of the provisions of the will that authorize the executor to sell real property; and a statement that such sale is within the best interests of the estate. A lawful deed in North Carolina states the consideration made for the transfer of title, contains an accurate legal description of the subject parcel, and recites the grantor's source of title. 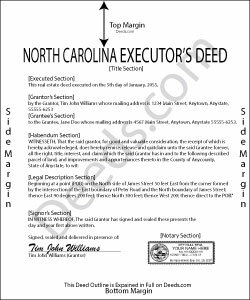 When properly executed and recorded, the executor's deed vests title to the within-described property in the named grantee(s). Any restrictions to the transfer should be noted in the body of the deed. The executor's signature must be acknowledged in the presence of a notarial official before the deed can be recorded in the county where the subject property is located. An affidavit of consideration or value may be required. Opinions differ in North Carolina on best practices when executing a fiduciary deed. Some buyers may be hesitant to accept a deed executed by the PR without court authority or without execution by the decedent's heirs. Consult a lawyer for guidance when conveying a decedent's real property. Consult an attorney licensed in the State of North Carolina with questions regarding executor's deeds, as each situation is unique.